Writing a novel is like climbing a mountain. If your footing is unsure, it's riddled with pitfalls. You need a plan. Bestselling author Ania Ahlborn is here to help in this four-week workshop. Writing a novel is like climbing a mountain. Without a clear path, you'll find it's riddled with pitfalls. 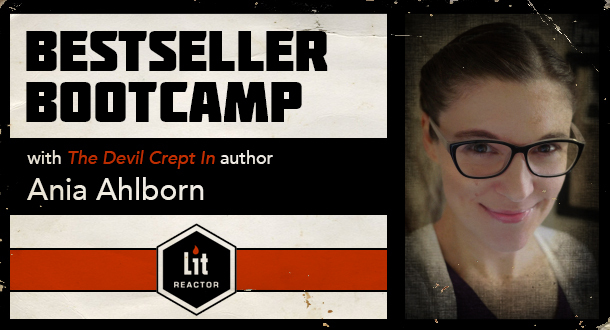 And in Bestseller Bootcamp with Ania Ahlborn, you’ll start your book-writing journey with a clear path and newfound confidence that will get you to those two seemingly unreachable words: the end. Maybe you’re about to embark on writing your first novel. Maybe this is your fifth and you can’t seem to get your thoughts together. Maybe you're prepping for NaNoWriMo. Doesn't matter. Regardless of how many times you’ve been around the block, you’ve got a novel in you, but the idea of writing that first chapter can be overwhelming. Plot, story structure, characters; where do you start? And then there’s the ever-elusive question every writer struggles with: do I need an outline, or should I cross my fingers and wing it? With Ania, a bestselling horror and thriller author at the helm, you’ll define and polish your storyline, fine-tune the major players in your book, and leave this four-week course with a fully realized synopsis that will not only guide you along your writing journey, but also serve as your pitch to potential literary agents and publishing houses. You will take the seed that is your story idea and begin to define just what your story is about. Through this expand-as-you-go process, you’ll begin to build depth to your plot while allowing your story to develop organically rather than force it in an unnatural way. By the end of this week, you will have a short synopsis that will serve as the building block for the rest of the course. This week, you’ll expand on your short synopsis by focusing on the characters that will live within your story. With focus on your leads, heroes, and villains, this introductory process of character development will aid you in thinking about your story in a new and invigorating way. By the end of week two, you will have the fundamentals of character development in place, and—aided with these new details—will expand your synopsis even further. Through intense focus on character details, you will continue to organically reveal story as it unfolds through the people in the story, rather than forcing the story along. By the end of this week, you will have a solid foundation for your main characters and a new understanding of where your story should begin and end, what scenes need to be added, what plotlines can be cut out completely, and more. Armed with three weeks of intense character and story work, and with your instructor’s notes and suggestions along the way, you will finish off the class with a fully realized book synopsis that will serve as your writing roadmap, from the first word of chapter one to your novel’s ever-elusive end. By the end of this week, you will not only have a clear picture of exactly what scenes you’ll need to bring your story to life, but you’ll also be armed with an ever-important summary that will aid you in your search for representation once your book has been written and polished. And, perhaps most importantly, you’ll be equipped with a writing process that can be used every time you find yourself starting a new story, novella, or full-length book. Clearly define what your story is about. Develop a deep understanding for the characters that will bring your story to life. Learn how to develop a writing project through an organic plot-and-character process. Master the art of structuring and restructuring plot before you start writing. Leave the course with a fully realized synopsis that will not only serve as a roadmap for your entire project, but can also be used in your search for agents and publishers in the future.